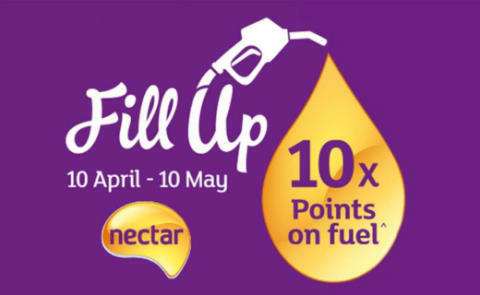 Between Friday 10 April and Sunday 10 May, customers can collect 10 points per litre purchased at Sainsbury’s petrol stations, simply by filling up and swiping their Nectar card, which is equivalent to 5p off per litre. And as there's no limit to how many times you can fill up during the month-long event, savvy shoppers can make the most of the offer and boost their Nectar balances to save or spend on a great range of products, entertainment and experiences at Nectar.com/spend. Base points on fuel are 1 point per litre of fuel purchases at Sainsbury’s petrol stations. From 10 April – 10 Mary inclusive, customers will receive 10 points per litre of fuel (inclusive of base points of 1 point per litre of fuel) purchased Sainsbury’s petrol stations, equivalent to 5p off per litre of fuel.